In the names of cdax and kinjhatman, the pinball train has to keep on a-rollin’!!! When I was a young boy, my family would take me to Christian private school to get smarter and learned. Those goals would occasionally come to a standstill (usually after school hours were over IN MY DEFENSE) because I eventually realized that the school’s Windows XP desktop had a frickin’ pinball game on it. Now, I was kind of in love with digital pinball as a whole shortly before and around that time. When I was about seven, I got one of those CD-ROM packs that had a bunch of pinball games on it—stuff like a wonky pinball table creator, the Duke Nukem-themed Balls of Steel that never worked on the Windows 95, and most notably, the incredibly fun Pro Pinball: Timeshock! The Game Coy Color game that I sunk the most time into was a rental copy of Pokémon Pinball, that I totally forgot to return to Blockbuster Video and basically owned thereafter; I’m pretty sure it still holds up pretty damn well even today. 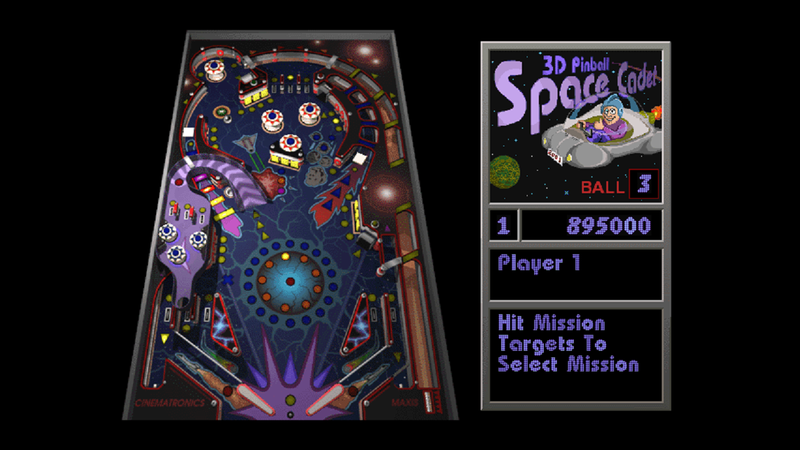 So it blew my mind the moment I realized that Windows XP actually came with a free pinball game of its own, 3D Pinball for Windows - Space Cadet. Apparently, it had actually been there since Windows 95, but for whatever reason, XP was the time that I personally became privy to it. How could I not possibly play it?? And it was incredibly fun! In fact, having actually just played it again recently because it is totally possible to install and play it on modern versions of Windows, adult me can vouch that it STILL is incredibly fun! It’s just thoroughly satisfying to whack the ball around and experience the mayhem. I absolutely love whatever the developers did with the physics of the ball and the paddles. It’s far from realistic, that’s for sure, but why be realistic when you have the option to be exaggerated? The paddles look like they move at an instant 100 mph. The steel ball collides against everything with unbridled gusto, and when you have like seven bumpers, nine flags to knock down, and wormholes that spit out balls like tank rounds, a lot of colliding is gonna go down. It’s purely ridiculous. I would have it no other way. Also, maybe it’s just my rose-colored nostalgia speaking, but I adore the sound design as well. The music is so cutely rinky-dink and quaint! Which is not just adorable, but also kind of hilarious when juxtaposed against sound effects that are as in-your-face as the physics are over the top. These sounds are, dare I say, iconic. This thing was—and still is—a bundle of joy, to put it succinctly. Little me and present-day me alike both owe it our gratitude.